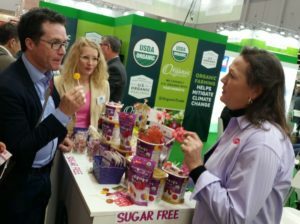 Exhibitors at the U.S. Pavilion at BIOFACH organic trade show reported on-site sales nearly double that of the 2017 show and “serious” business contacts up by over 50%. On-site sales in 2018 were reported at USD $610,000. Such represents not only the success of the show itself, but also the continued growing demand for organic products in Europe. 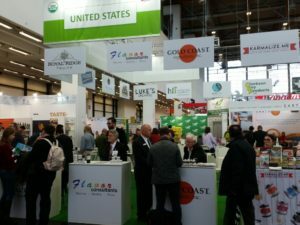 The Foreign Agricultural Service (FAS), Office of Agricultural Affairs in Berlin, with the Organic Trade Association (OTA), and U.S. organic food and product companies participated in the BIOFACH trade show February 14-17, 2018. BIOFACH is the world’s leading trade show for organic food and food products, held every year in Nuremburg, Germany. According to show organizers, BIOFACH 2018 hosted a record 3,218 exhibitors from 93 countries, including 24 U.S. organic food and food ingredient companies in the U.S. Pavilion. Companies in the U.S. Pavilion displayed and promoted a variety of USDA organic products – everything from nut butters to candy, food ingredients to grains and beans, dairy to poultry. You could find it all in the U.S. Pavilion! New to BIOFACH this year, FAS Berlin contracted with a local photo booth rental company. 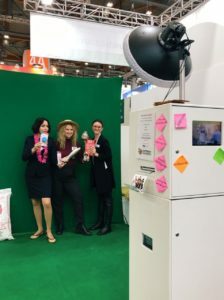 In the photo booth, set in the U.S. Pavilion, exhibitors and visitors were encouraged to take fun photos, which they could keep as their BIOFACH souvenir. Included on these photos were the USDA logo, USDA organic seal, and link to FAS website. In total, 245 photos were printed on the spot. Visitors could also download the pictures and share them on Facebook and other social media channels. The social media outreach is expected to amount to approximately 17,000 contacts. 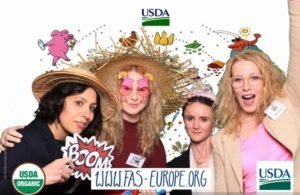 In addition, FAS handed out approximately colorful 350 tote bags, with the USDA logo, FAS Europe website, and U.S. commodities artfully displayed. In all, FAS Berlin handed out approximately 600 point-of-sale materials promoting the USDA, FAS, and FAS Europe website. As one highlight during the annual trade show, Harald Ebner, Green Party member of the German Bundestag, toured the U.S. Pavilion with Kelly Stange, Agricultural Counselor at the U.S. Embassy in Berlin. Additional pictures can be found on the @FASEurope Twitter Channel.